We recently had a video conference with the team from Texas Digital Library. They wanted to pick our brains about Supplejack, an open source information management tool we built for DigitalNZ. Our developer Edwin Rozario told me they were “super excited” by the tool and had been talking with other outfits who were similarly keen. The power behind an award-winning website, Supplejack is a metadata aggregator. Now I realise that not everyone reads that phrase and immediately thinks, “at last, tell me more”. Stick with me though, because Supplejack can help with one of the key issues in the 21st century: access to information. Find out how it does this, where it came from and whether it can help your organisation. Supplejack makes information easier to collect, find, share and use. Organisations often want to share their data and digital assets. They might want to do so internally, with other organisations, or with the wider public. These digital assets could be all sorts of things. They might be documents, publications, product specifications and photos, how-to videos, news stories, artifact records in museums and galleries, the list could go on for ever. The problem is that these collections often live in different systems. This tends to mean that the information used to describe and categorise the assets—the metadata—is structured in different ways. And this makes it harder for people to gather, search and use the assets. That’s where Supplejack comes in. As mentioned, Supplejack is an metadata aggregator. It pulls together the metadata about the assets from many sources and structures it consistently so the assets can be easily found. You can think of it as working in a similar way to travel sites like Trivago or Expedia or movie review sites like Rotten Tomatoes or Metacritic. Boost built and maintains Supplejack for DigitalNZ, part of the National Library of New Zealand. DigitalNZ’s vision is to make New Zealand digital content easy to find, use and share. More and more of our cultural assets are digital. Some are digitised versions of physical artifacts like photos of artworks, recordings of performances or scans of newspapers. Others are already digital when created: podcasts, news videos and so on. Increasingly we are publishing things like books, magazines and research papers digitally as well as, or instead of, the paper versions. flexible enough to handle almost any data thrown at it. DigitalNZ currently uses Supplejack to harvest, search and share 30 million metadata records from hundreds of content partners. Where once you might have needed to go to each of these sites in turn to get this information, now you can find it all in one place. You can search, collect and share all the content from the DigitalNZ website. Or you can go to the other websites that use their API (an Application Programming Interface is basically a set of rules that let you plug one digital tool into another). 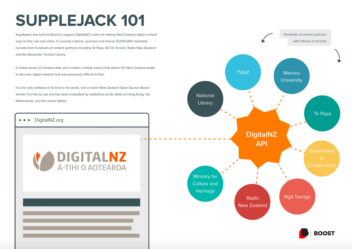 Like the rest of the technology behind the DigitalNZ site, Supplejack is both built using open source software and is open source itself. This means that anyone can use and enhance Supplejack. It’s probably not surprising then that in 2016, DigitalNZ won the government category at the New Zealand Open Source Awards. surfacing the standardised data via a public API. It transforms messy data, creates a unified search index and makes consistent metadata widely available via an open API data service. Supplejack also operates at scale. It can harvest metadata about millions of items, from hundreds of data sources, across many different data formats. These include HTML, RSS, XML, OAI-PMH and RDF/XML. Given its origins, Supplejack particularly suits the GLAM sector (Galleries, Libraries, Archives and Museums). But it will also be the tool of choice for many agencies wanting a metadata harvester that lets you easily manage the harvest, and the subsequent use of the data. This might include research and educational institutions, government agencies and corporates. Some organisations might use Supplejack as part of their enterprise content management solution. Those made up of disparate units using different systems to store their digital assets are obvious candidates. This means that Supplejack could be particularly useful following business mergers or public service amalgamations. It can solve some of the sticky interoperability problems these unions create. Why is it called Supplejack? It gets its name from a native New Zealand vine. Like the tool, supplejack or kareao (Ripogonum scandens to its friends) sends out tendrils that create an ever-growing network of connections. In fact, the vine can grow by 5 cm a day. Just as you use the tool to tie together digital resources, Māori used the vine as a rope and wove it into baskets. You could even call the plant ‘open source’. 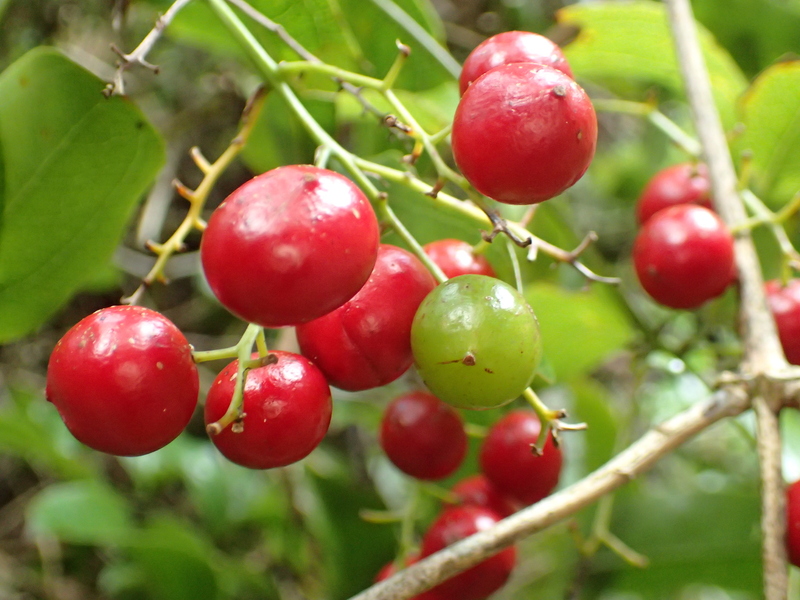 If you have a taste for bush tucker, the young shoots and berries are said to be edible. The latter are certainly popular with kakapo, if the berries in the beard below are anything to go by. It’s been picked up by organisations ranging from local agencies such as Ngā Taonga and Te Puni Kōkiri, to international players including the New York Public Library, the University of California and Europeana. We can help you decide if Supplejack is what you need, as well as assisting with installation, support and extension projects.